The Tundra Buggy® Lodge, located in the heart of polar bear country, offers a unique, immersive experience where guests can fall asleep and wake up with polar bears right outside their window and, on a clear night, the northern lights dance above, unhindered from the lights of town. The Lodge consists of two accommodation units that can sleep up to 40 guests, a lounge, a dining hall, and staff quarters. Outdoor viewing platforms connect each unit and allow for outdoor photography. Situated far from the lights of town, the Tundra Buggy® Lodge is the perfect place to view bears all day long and have optimal northern lights viewing at night (weather permitting). The Lodge is also equipped with exterior field lights that enable us to continue watching the bears even after the sun goes down! 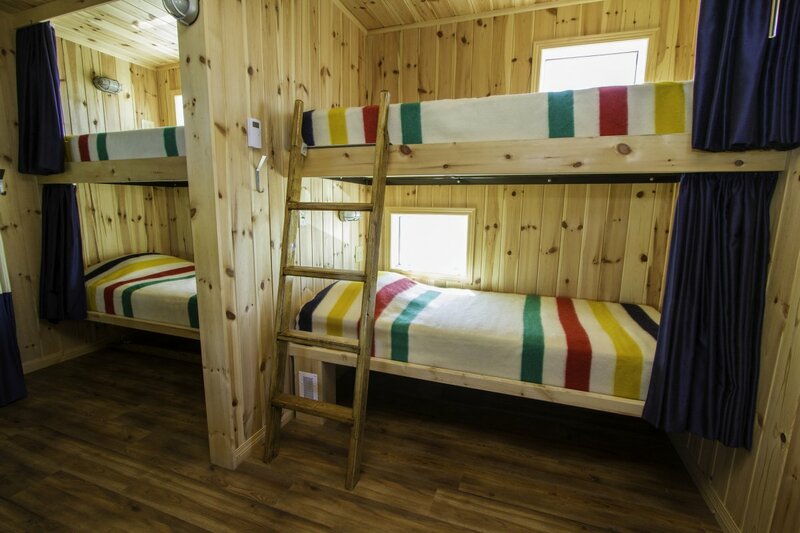 The accommodations, named Hearne and La Perouse after two important figures in Churchill's history, consist of 10 upper and 10 lower sleeping berths, each with a window, a reading light and four 110-volt electrical outlets. Each berth houses a standard twin-sized coil mattress 190 cm long by 98 cm wide (74.5 in long by 38.5 in wide). A sound-dampening curtain provides privacy by separating the berths from the aisle. 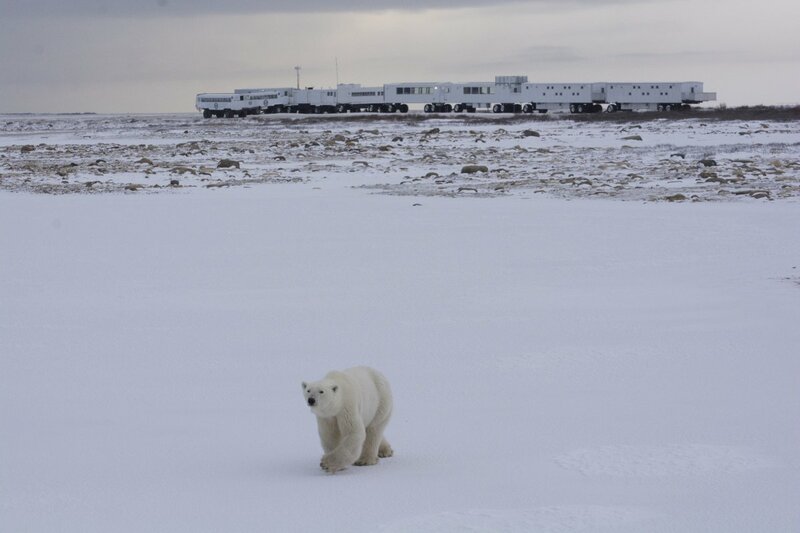 To combat the naturally arid conditions on the tundra, our accommodations are humidity controlled. As well, each berth is equipped with a thermostat controlled heating unit, giving guests the ability to adjust the berth temperature. Bedding, towels, and even earplugs are provided for your comfort. In addition, each 20-person accommodation unit has three bathrooms, two of which are equipped with showers. Find out what it's like to sleep among the polar bears. 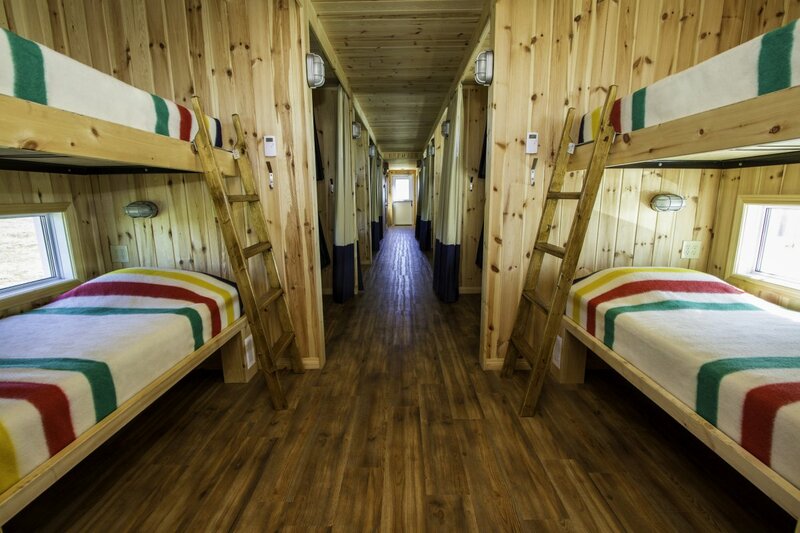 View the inside of the accommodations on Google Streetview. 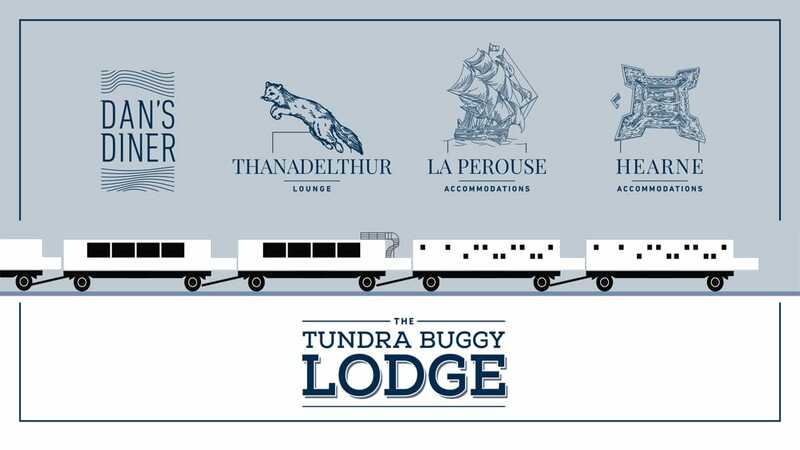 Our new lounge, named Thanadelthur after another important Churchill figure, was introduced into the Tundra Buggy Lodge fleet in 2016. 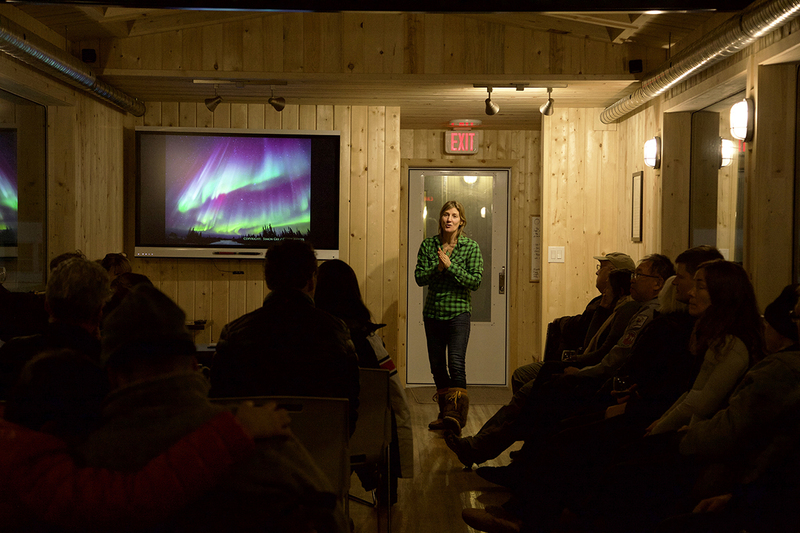 It is used for relaxation, presentations, wildlife and northern lights viewing and more. Thanadelthur has WiFi accessibility, a multi-touch SmartBoard screen, and a robust audio system. Guests are invited to mingle over wine and appetizers before dinner, socialize, play cards or board games, and read. 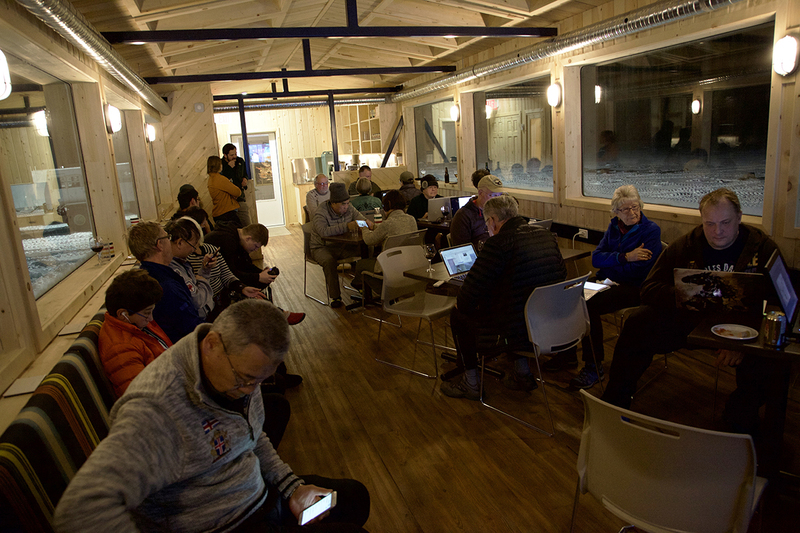 After dinner, enjoy presentations by the staff and wildlife experts who join us at the Lodge, including leading researchers from Polar Bears International. Thanadelthur is also a great place to swap stories and share images. View the inside of the Thanadelthur on Google Streetview. Thanadelthur includes panoramic views from the wall-to-ceiling windows. 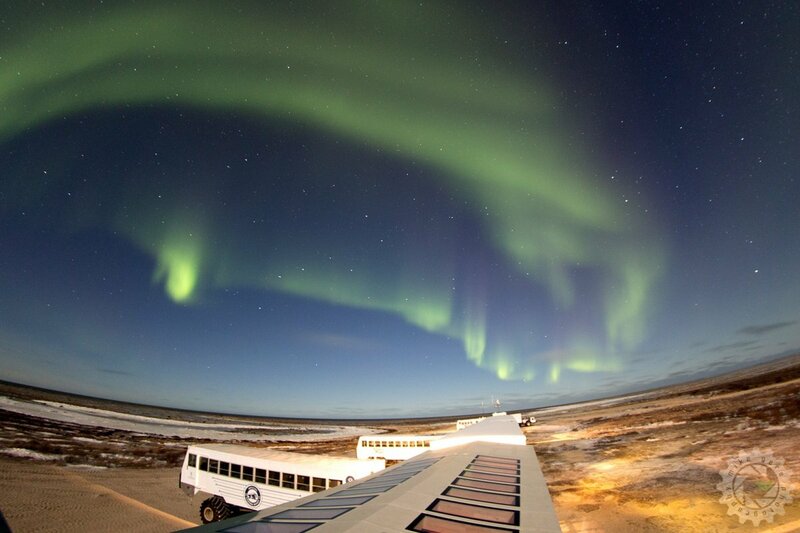 It also has a roof-top observation deck for a 360° view of the tundra and wildlife or an unobstructed view of the northern lights. Enjoy the view from the observation deck on Google Streetview. Below is a photo captured from the roof-top observation deck. 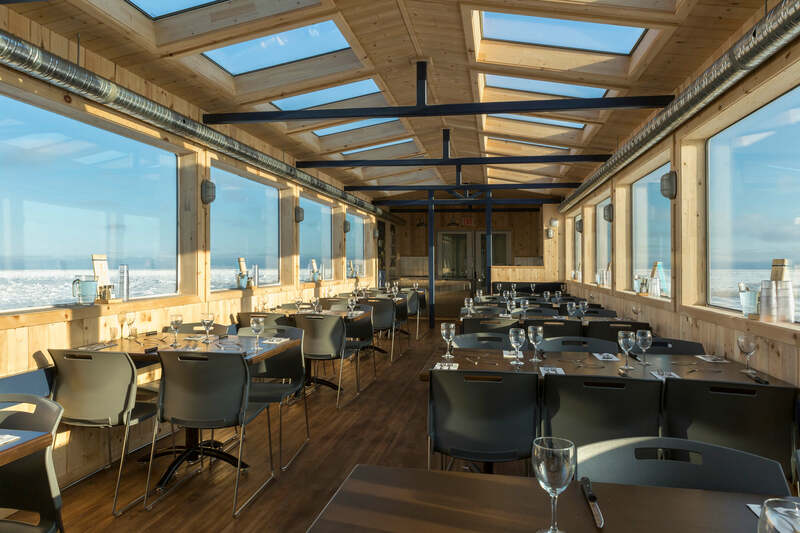 Our Tundra Buggy Lodge dining hall, affectionately known as Dan's Diner, is where you will find our Lodge chef Jared cooking up a storm of regional cuisine and hearty home-cooked favourites. 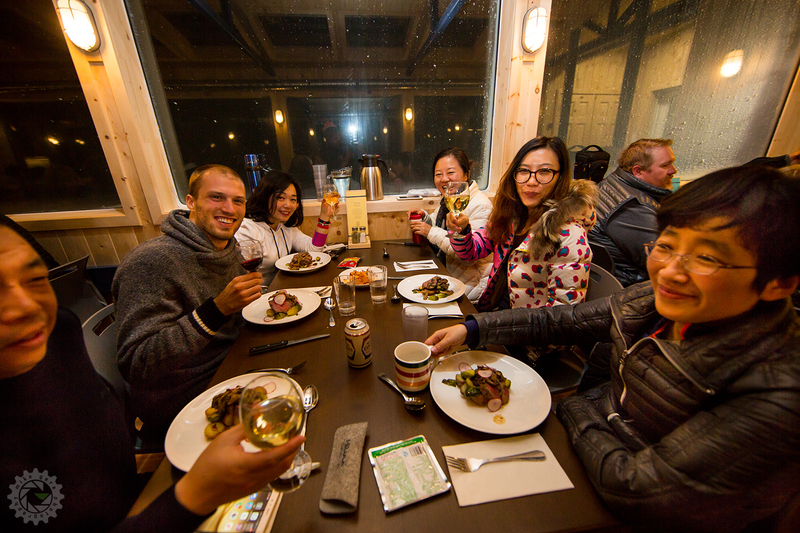 Enjoy a filling breakfast to prepare for your day of wildlife viewing on the tundra, and a delectable dinner with fellow guests to end off a successful day. Breakfast may consist of hot and cold cereals, muffins, fruit, toast, pancakes or eggs. Lunch will be a picnic-style lunch of soup and sandwiches served on the Tundra Buggy. Dinner can include anything from chicken, to bison lasagna, fish or pasta and regional cuisines such as elk and arctic char. Coffee, tea, hot chocolate and juices are available throughout the day. Special dietary requirements can be accommodated at the lodge with prior notice. View the inside of the dining car on Google Streetview. Find your perfect Tundra Buggy Lodge experience on the Frontiers North Tripfinder.